School Education – Engaging the services of (9335) Vidya Volunteers through School Management Committees (SMCs) with an Honorarium of Rs.8000/- per month in the Academic Year 2016-17 - Permission Accorded – Orders – Issued. Government Memo No.3630/SE.Prog.I/Deptt, dated 18.6.2016. 5)From the Director of School Education, Telangana, Hyderabad, Lr.Rc.No.330/PS2-2/2015, dt.27.06.2016. 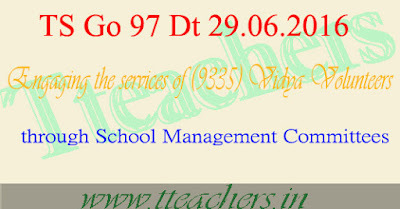 1.In the circumstances reported by the Director of School Education (DSE), Telangana, Hyderabad in the references 2 examination of the matter Government hereby accord permission to the DSE, Telangana, Hyderabad to engage the services of (9335) (Nine Thousand, Three Hundred and Thirty Five) Vidya Volunteers with an Honorarium of Rs.8000/-(Rupees Eight Thousand only) per month in the Academic Year 2016-17. 4) In the reference 4 the Director of School Education in permitting the District Educational Officers in the State to engage the services of (1606) Vidya Volunteers through School Management Committees in the Schools, where there are no regular Teachers available for the year 2016-17.